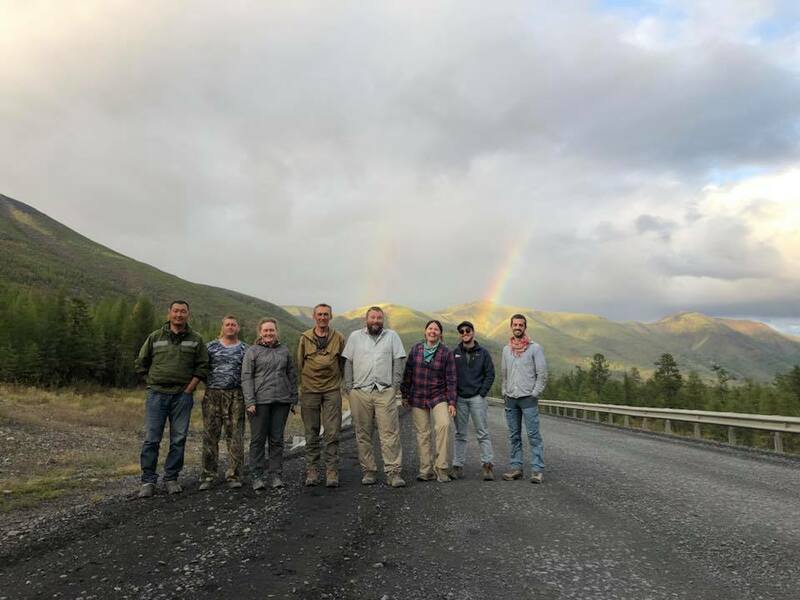 From August through early September, we spent four weeks in Russia, three of which were in remote eastern Siberia, doing field work at the slowest convergent margin (i.e., where two tectonic plates are moving toward one another) in the world! 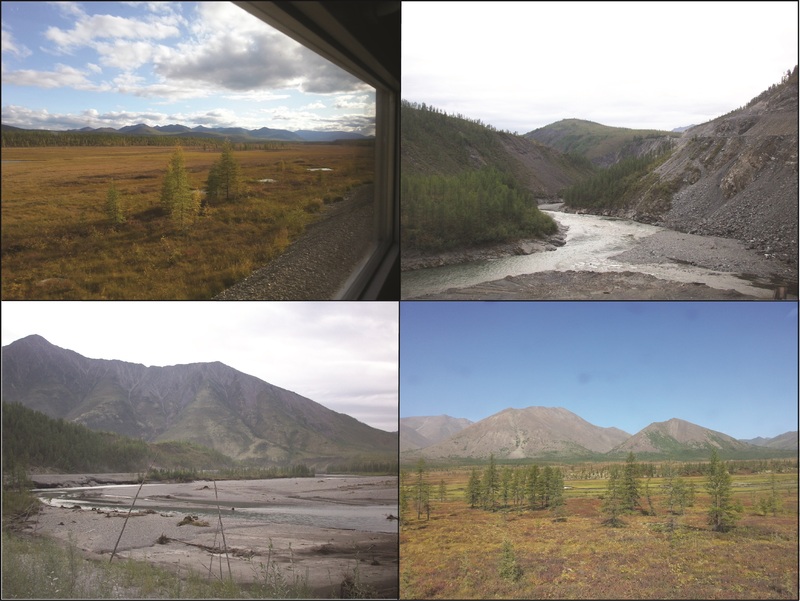 We traversed the dramatic terrain of the Verkhoyansk fold-thrust belt between the towns of Yakutsk and Ust-Nera and down the Indigirka River, taking samples for geo-thermochronometric and paleomagnetic analyses as part of the NOR-R-AM international consortium (Norway-Russia-North America, https://norramarctic.wordpress.com/). Our advisor, Dr. Daniel Stockli, is a co-PI of the consortium. (See Sept 12, 2018 Science Y’all post by Margo Odlum (PhD ’19) about NOR-R-AM’s Svalbard program: http://www.jsg.utexas.edu/science-yall/midnight-sun-in-the-high-arctic/). Figure 1. Our three-week traverse overlain on GoogleEarth satellite imagery. The team collected 85(!) samples for geo-thermochronology and over 60 samples for paleomagnetic study. The Kamaz truck was our mode of transport for most of the trip, but we did take a four-day excursion down the Indigirka River in a trio of small boats. Our nine-person team was composed of five Russians and four Americans (one American is a Research Associate at CEED at the University of Oslo and represented Norway). Our journey began in Yakutsk (62°N, 129°E), the capital of the Sakha Republic and the home of the Diamond and Precious Metal Institute of Geology, part of the Russian Academy of Sciences. 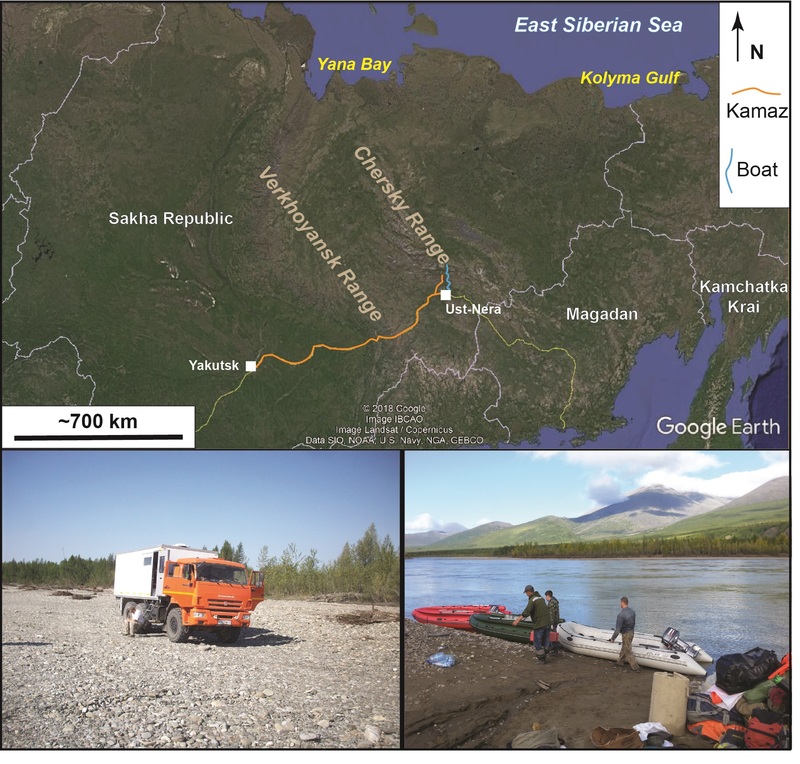 The turn-around point for our journey was ~100 km north of Ust-Nera, along the north-flowing meanders of the Indigirka River (65°N, 143°E). Our traverse covered ~1000 km between the southwest to the northeast points. The trip was certainly unlike anything we had done before! 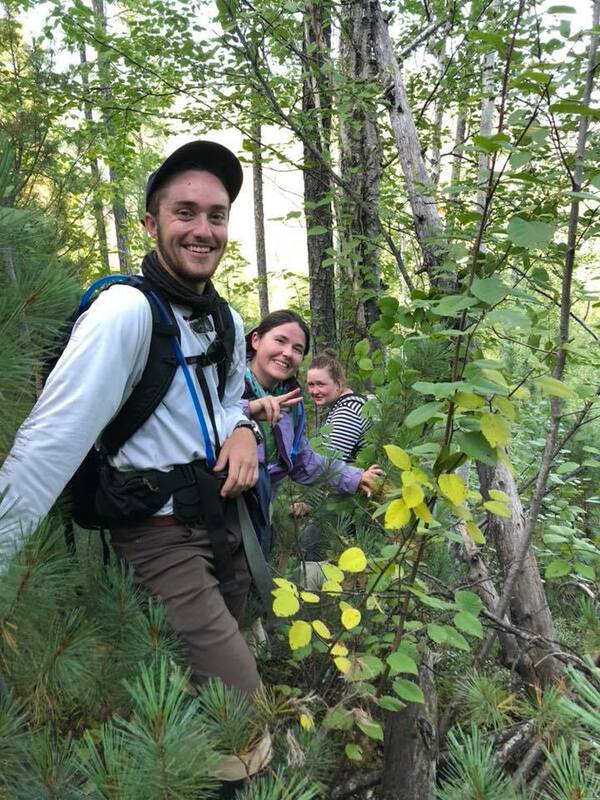 From hiking through dense taiga vegetation and soggy bogs to fording rivers in thigh-high rubber boots (see Figure 3, below), we quickly got a taste for Siberian-style field work. The scenery and the geology were nothing short of jaw-dropping and the people were fantastic. Despite being from two nations involved in a complex political relationship, the camaraderie among the geoscientists proved that people will watch out for one another, and bond over shared interests (i.e., geeking out over rocks). Figure 3. A. Sam Robbins (M.S. ’20) sporting his field fashion sense in thigh-high waders. B. Drs. 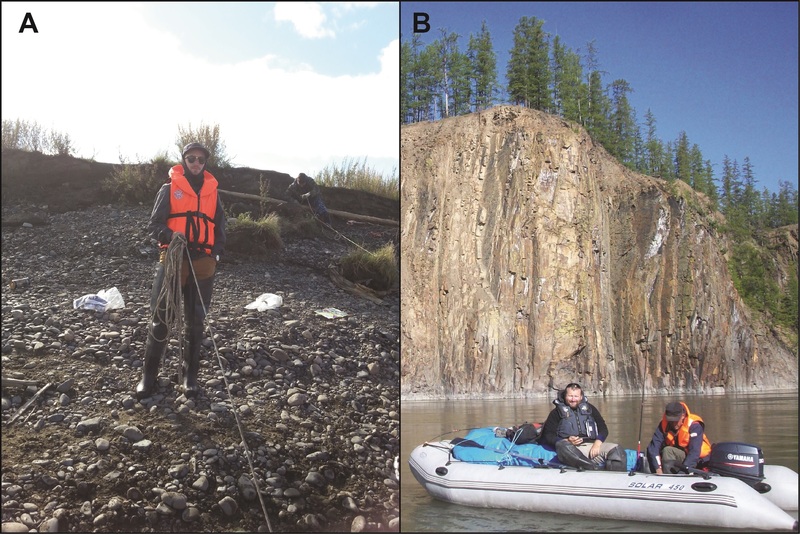 Danny Stockli (UT) and Andrei Prokopiev (Yakutsk) posing in front of sub-vertical Triassic (252 – 201 Ma) strata. Figure 4. Typical scenes of the taiga environment throughout our trip. Use paleomagnetic analyses to constrain the position of eastern Siberia, particularly in the Triassic and Jurassic (252 – 145 Ma) where previous data are sparse. Use detrital zircon U-Pb geochronology to refine provenance analyses (i.e., use the ages of zircon crystals within sedimentary rocks to derive their likely source areas), particularly on both sides of the Adycha-Taryn fault zone (the proposed, but debated, suture between the Siberian craton and the North American craton). Additionally, the ages of late Mesozoic (~174 – 66 Ma) arc magmatic rocks will be refined with zircon U-Pb geochronology. Geochronology and thermochronology utilize the known decay rates of radioactive isotopes to determine the ages of minerals within rocks. For example, it takes ~4.5 billion years for half of a known amount of 238U to decay into 206Pb. This amount of time, known as the half-life of 238U, is constant, so by measuring the ratio of 238U to 206Pb in a mineral, we can calculate how long that mineral has been “losing” 238U and accumulating 206Pb. In the case of the mineral zircon, this amount of time is coincident with the age of the zircon crystal. Because tectonic plates are moving across Earth’s surface, pinning down a plate’s position (latitude and longitude) through geologic time can be tricky. Paleomagnetic studies utilize the alignment of magnetic minerals within a rock to calculate the angle between the rock and the Earth’s magnetic pole at the time the rock formed (i.e., the rock’s or formation’s latitude on Earth’s surface at the time it formed). Both paleomagnetic and detrital zircon data should allow the team to ascertain whether the proposed Oymyakon Ocean existed between the Siberian craton and the amalgamated terranes to the east (i.e., those terranes comprising the suture between the N. American and Eurasian plates). While the samples are being processed through mineral separation at the University of St. Petersburg, we look forward to gathering the zircon geo-thermochronometric results here in the UTChron Laboratory! Figure 5. A. An aplite dike (K(? 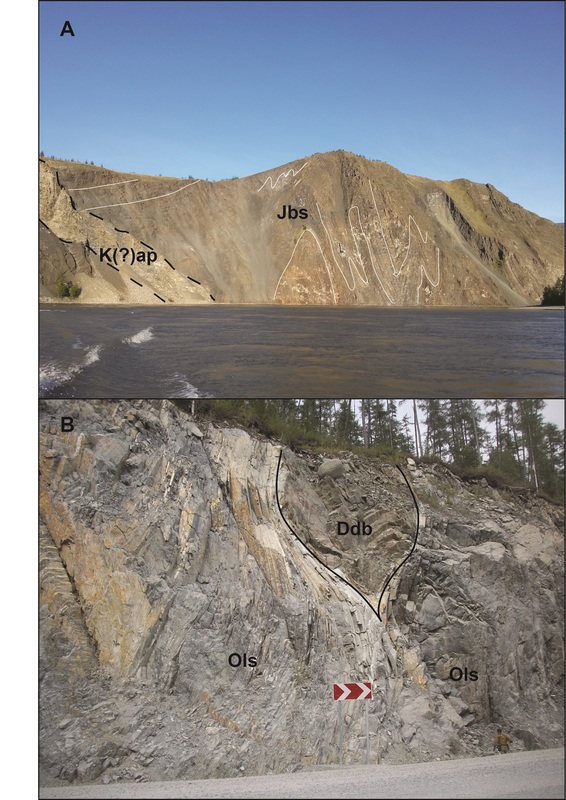 )ap) cross-cuts chevron folds in Bajocian-age sedimentary layers (Jbs) along the Indigirka River. B. A boudinaged Devonian diabase dike (Ddb) within Ordovician carbonates (Ols) in the western thrust sheets of the Verkhoyansk fold-thrust belt.